Local blogger Crystal “Pikko” Watanabe is a guru in the way of the bento — the traditional Japanese meal in a box. I became a fan through her many incredible “LOST”-themed bento creations, which were regularly featured on KITV‘s morning show. But there’s a lot more to bento making, which is a true culinary art. If you’ve got kids, you’ll love this book, as it is full of ways to make food fun. Whether you’re putting together a Japanese bento or just a basic lunch for your little ones, “Yum-Yum Bento Box” can show you how to make shapes, letters, even animals out of vegetables, eggs, rice, and more. Tip: If attempting the quail egg bumblebee, start the night before. This book could easily inspire anyone to create some cute eats. Though I’m fairly certain my attempts wouldn’t turn out quite so adorable or photogenic. 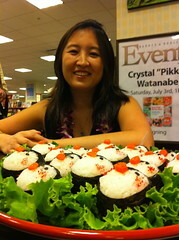 We stopped by one of Crystal’s first book signings today at the Barnes & Noble store at Ala Moana. (Maki is also making the rounds.) She was there with her husband and two kids, and even put out a tray of adorable “penguin musubis.” My daughter was not shy in nabbing one, but at least savored every bite. Crystal had quite a few fans stop by, but was kind enough to chat with us and, yes, sign a copy of her book. For updates, keep an eye on her blog and book site. Of course, if you can’t get to one of her book signings, you can still buy a copy of her book from a number of online and brick-and-mortar stores. I bought Crystal’s book for my kids and they are loving it! They have the patience to try her wonderful ideas and they’re suprising me with some delightful bentos made in our EasyLunchbox containers! So fun and it’s really inspiring their creativity. Thanks for such a nice review, Ryan. It was great to finally meet you and your family. Your daughter was a delight to talk to! Wow they bring it to life aloha. hope they drop by for book signing in one of the Maui Hawaii’s Beautiful North Shore and exploration relax in our shaded garden or on your own private lanai. be inspired and inspirational.